It’s been a good week for content updates, as not only did Battle Bears -1 [99¢] receive a massive update with new levels, weapons, and enemies but another one of my favorite shooters Puppet War: FPS [$1.99/Lite] has expanded on their original game in equally impressive fashion. Puppet War puts you in the role of an unfortunate janitor who is trapped on the set of a popular kids show. The puppets that star in the show have decided to take over the world, and it’s up to you to fight them off with the many dangerous weapons that are inexplicably lying around the studio. The completely silly style of the graphics and story coupled with the satisfying first-person shooting action combined to make for an incredibly fun experience that we really enjoyed in our review. This new update takes that concept and runs with it, adding some great new features and tightening up the game overall. One of my main complaints about the initial release of Puppet War was the lack of different locations, and this has been remedied with an entirely new map and a variation on the original. Puppet Town is an L shaped arena made to look like a city street. It features cardboard cutout cars that can be destroyed and puppets that pop out of trashcans that fire tomatoes at you. Also, the original Studio map gets a nighttime version. Lighting is dim here, and the set decorations are outlined in bright neon lights. It sets a terrific mood, and while it essentially plays the same it’s different enough to feel like a new location. It’s also the perfect setting to debut one of the new enemies, the zombie puppet (the other new enemy being a ninja puppet). There is a nighttime version of the new Puppet Town set as well. Another big addition is a Survival mode. Here, you can choose one of the four locations and battle an endless onslaught of all the various puppets. The goal is to see how many puppets you can take out before dying, and they will occasionally drop ammo and health packs to keep you going, but there is no money to be earned. Instead, you’ll use the weapons you’ve unlocked during the campaign, and the Survival maps are unlocked through the single player story as well. A zombie Survival mode can be unlocked too, and features a foggy haze in the level and strictly zombie enemies. The Survival mode is a ton of fun, and is a good way to jump right into some action when you feel like taking a break from the campaign. 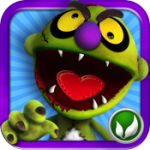 Besides these major additions, a ton of other refinements have made their way into Puppet War. OpenFeint has been integrated for high score and achievement tracking. Also the game plays quite a bit faster in regards to weapon switching and ammo drops, and it feels like an all around tighter experience. There is now 3 difficulty settings to choose from, and options to invert aim and change left/right handed controls have been added, which was another complaint I had from the initial version. Puppet War was a fun game to begin with, and this update has gone a long way to making it even better. If you haven’t picked up the game yet, you can give the game a try with the brand new lite version that was released today and features an exclusive boss fight that will make its way into the full version down the road. Screens of the new boss and player impressions can be found in the game thread in our forums. 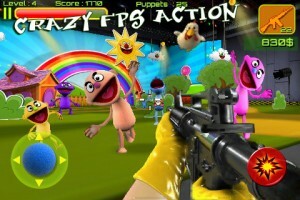 Previous owners of the game should make sure to update and check out all of the new stuff in Puppet War: FPS.